SB-190 Everseal is a versatile adhesive sealant that forms a permanent bond with an incredible number of surfaces. Contracts and expands thermally to bond disparate surfaces. 500% elongation when fully cured. Forms a waterproof and impact resistant bond. 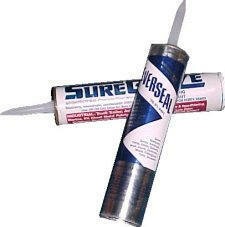 Not recommended for use with copper or soft expansion joints, polystyrene or styrene containing plastic. Interface and surfaces must be clean, dry and free of dust, dirt, oil and water proofing and release agents. Cut cartridge nozzle at slant to 1/4” hole and puncture inner seal, apply bead size as desired. Apply uniform bead with steady pressure. Tool immediately after application to ensure full contact with both sides of the joint area. Sealant starts to skin over in 20-25 minutes. Minimum application temperature of 50º F.
While uncured, remove excess material from tools with naptha or mineral spirits. See cautions on cleaner labels. Storage: Unopened containers should be stored in a cool, dry area. Keep above 40º F before use. Caution: For industrial use only. Skin and eye irritant. Harmful if swallowed. Avoid contact with or breathing in of vapor and use adequate ventilation. Harmful if swallowed. Avoid contact with or breathing in of vapor and use adequate ventilation. Material on skin should be wiped and washed off with soap and water. For eyes, flush with water and seek medical attention.